It was a bike with an orange petrol tank. I think that means it’s a KTM. My friend Guy has one. Anyway, it was lying on its side and an angry looking police officer was waving us by. I forced myself not to look but my peripheral vision caught the all too familiar sight of a group of green garbed medics crouched around a prone body. A witness held his helmet tight, no doubt in the hope of staving off a lifetime of being pushed in four wheels rather than the thrill of pushing himself on two. The accident was just before the westbound exit at White City on the A40. It must have happened just moments before, as I had traversed the opposite side of the carriageway maybe 10 minutes earlier. I’d gone there because as most London drivers know, it’s devoid of speed cameras and on a Sunday evening usually quiet. I wanted to have some quality time with my car. We’d already gone for a run down to Kensington High Street. It had waited on the street as I watched Seeking a Friend for the End of the World. (Not a movie to watch if you’re having any kind of existential crisis by the way.) But after the credits rolled and I emerged into the gloaming, I wasn’t ready to go home . A final little circuit before parking-up was needed. Yesterday was my last day with my car. To be clear, it is just a car. It’s not even my first car but I suppose it’s the first car I’ve loved. There’s nothing particularly special about it really. I mean it’s a nice car – a Mercedes Benz CLC 200 – but it’s not a classic and I’ve never named it or called it ‘she’. It is just a car. An emergency chocolate caramel whilst driving is as far as it’s eating experience goes but I’ve never been precious about it, it’s just a collection of metal and alloys and stuff after all. So it returning to the dealer today because it’s lease is up shouldn’t be a big deal, really. But somehow it is. Over a trio of years marked by firsts and lasts, change and upheaval, the car has been a constant; a marker in time. Letting it go marks the end of a chapter. Two weeks after the car came into my the love of my life left. He never even drove it so scared was he that he would ding it. I still have a copy of the text message I sent him saying, good news! Someone has scraped it in the BBC carpark! I couldn’t be annoyed even though it was only a week old. I was honestly pleased that when he returned to the UK he would be able to drive it without fear of making the first bump or scrape. In fact today is almost three years to the day since we took our inaugural trip in the car. 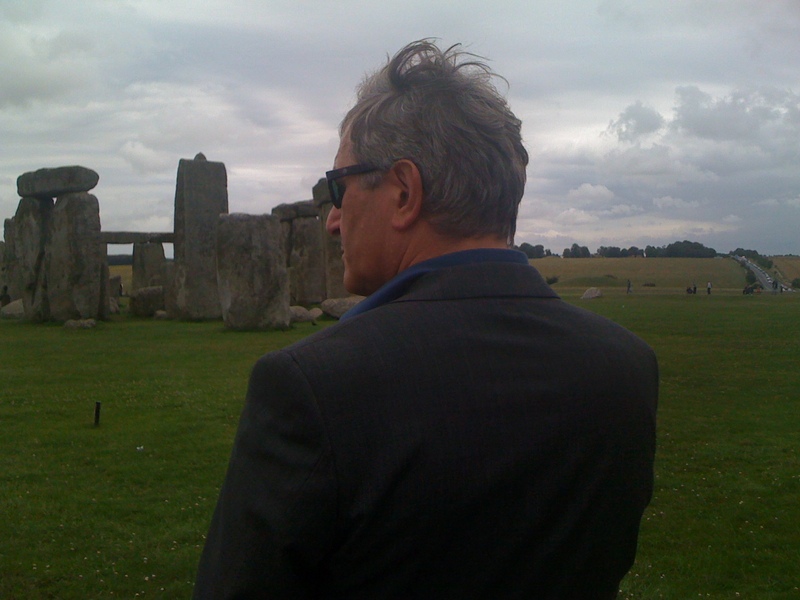 We went to Stonehenge, then on to Babington House before visiting friends near Bath. A great outing for the car. A chance to enjoy its new smell and for me the novelty of responsive speed. (My previous car was a Ka. Pretty much a roller skate with an engine) I remember it was a rainy weekend that July too. Cold and windy but I was pathetically impressed by the auto-sensor windscreen wipers. At the end of the weekend we headed straight to the airport as he was off to Munich. We were stuck in traffic for an age and I wondered if we’d make the flight. The ETA on the Satnav (another novelty) kept teasing us. But we made it and from the driver’s seat at Heathrow Terminal 5 I watched him walk away and turn to wave a kiss, as usual. This was nothing new. Our relationship was punctuated by trips to airports. But I would always watch him walk away until I could see him no more. I never took him for granted. I think I always sensed the fragility of love. That said, on this ordinary Sunday it never occurred to me that I would never see him again. A few days later I was in that same driver’s seat when I got a call from Germany asking me where I was. I told the unfamiliar voice I was driving. The voice darkened and told me to pull over. Before I registered the tone I laughed and said I couldn’t. I was on the M4, stuck in traffic – again. And so it was while inching towards London, in a still new, black leather seat, my world fell to pieces. The car became the last place we were ever together. After the funeral, I went back to work quite quickly. The show I was making had already been delayed for me for 2 weeks. I had to return or lose the job and I needed it emotionally. I’d had a tough couple of years career-wise and he’d been so happy for me that I’d got the role, I couldn’t let him down. And so I started on the job, commuting in my lovely car to West London or the Oxfordshire countryside where were filming . Getting in my car became a bright spot in the day. Amongst all the turmoil, the car was shiny and new. Safe and of course, he was still there, stretched out in the next to me with his hand crooked behind my headrest or gently on my leg. I remember the first person I let sit on the passenger seat. She was not to know the significance I felt of course. Yet I burned to tell her. Sanity prevailed and I didn’t for fear of being thought foolish. 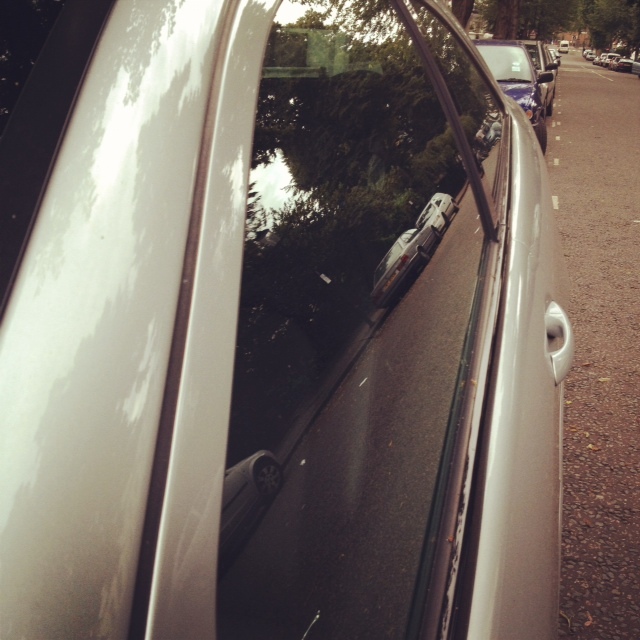 So my drive around London in the late evening sunlight of a warm St Swithin’s day has marked a goodbye. I self-indulgently cried and regretted my decision to let the car go and with it, another bit of my lost love. In truth I was wallowing, feeling really rather sorry for myself. And then I saw the blue lights. They snapped me back into reality. As I write this I have no idea if the motorcyclist is chatting with a nurse over a cup of tea or some other woman is arranging a funeral somewhere, her turn to find her world torn into pieces. All I know is that last night a motorcyclist was out for a drive and in the sliver of a moment, his life changed forever. I know what that feels like. And I suppose that is why letting this car go is much harder than I thought it would be. Turns out, sometimes a car is more than just a car. Since writing this entry, my car has been collected by British Car Auctions. They did an inspection and told me I would have to pay £750 for damage repair. There is barely a mark on the car. I also had both bumpers resprayed and the alloys refurbished at a cost of £600 just last week. Needless to say Mercedes Benz’s ridiculous standards have left a very sour taste in my mouth. It’s almost as if you aren’t expected to drive the car at all for 3 years. Even the BCA guy looked embarrassed. So I guess I’ll never be buying another Merc. Fuckwits.